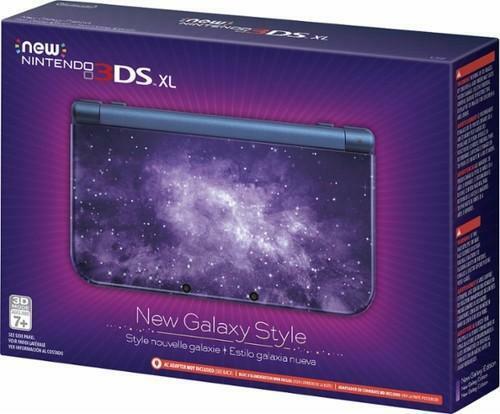 Enjoy new look of your favorite console in Galaxy style. Console and owner's manual included. Access games, multiplayer action, movies, and live TV all with one device. Plays all Nintendo DS games. Challenge your friends or the whole world anytime, anywhere with Wi-Fi. The 3DS features two screens, including one 3D screen and a touch screen with the stylus interface that offers unique gameplay experiences. The 3DS XL features 90% more screen real estate than the original 3DS, giving you a better view into the game worlds you love. Includes a right-hand analog thumbstick and ZL and ZR buttons, that are not available on the original 3DS XL models. Nintendo Video allows you to download videos and watch them in 3D. Exchange data with other 3DS users to play fun minigames, collect digital items or unlock additional features in the games you play. Get updates and bonus content for several of your games, even while your 3DS is in sleep mode.